The House has already voted to approve the $789 billion economic stimulus plan (called American Recovery and Reinvestment Act of 2009) President Obama has sought since he took office less than a month ago. The Senate will take on the bill later today and it could be sent to the President for his signature as soon as this weekend. Early this week, I posted highlights of the stimulus package. But that post was based on data that some are no longer in the final bill, or have been changed a lot as the Congress wanted to keep the overall cost down. For example, first-time homebuyers can get $8,000 tax break instead of the $15,000 original proposed and approved by the Senate. Also tax cuts for couples have also been reduced to $800 ($400 for single) instead of 1,000. Even though details of the final bill will take some time to emerge, I was able to draw this pie chart based on this rough breakdown on Portland Channel 8 News. Making work pay credit: $400 per worker and $800 per couple tax credits in 2009 and 2010 in the form of reduced paycheck tax withheld. The credit will phase-out when a single earner’s modified AGI is more than $75,000 or $150,000 for married couple filing jointly. $250 economic recovery payment: Retired people on Social Security or veterans will receive a one-time payment of $250. $8,000 first-time homebuyer credit: First-time home buyers will receive $8,000 tax credit when buying a home in 2009 and you don’t have to pay the credit back after 36 months. AMT Patch: The income limits for AMT exemption for 2009 are $70,950 for joint filers and $46,700 for single. New car purchase tax deduction: New car buyers will get an above-the-line federal deduction for state and local sales taxes or excise taxes on the first $49,500 of a car’s purchase value. The phase out income limit is $125,000. American opportunity education tax credit: For 2009 and 2010, HOPE program will be enhanced to allow up to $2,500 tax credit be claimed against educational expenses. Phase-out begins for singles with $80,000 AGI or $160,000 for joint filers. Qualified tuition programs: Withdrawals from 529 college savings account can be used to purchase computers and internet services. 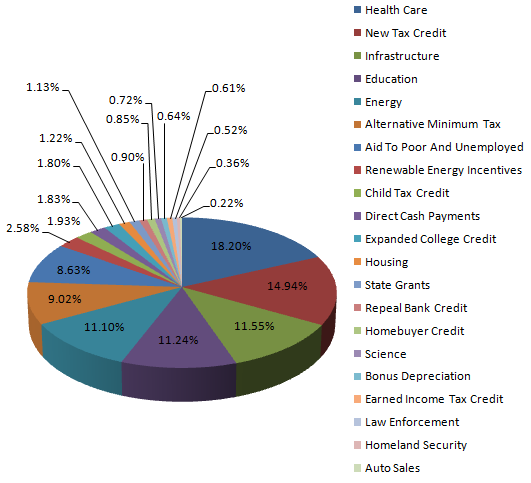 Earned income tax credit: For 2009 and 2010, EITC will be increased to 40% of the first $12,570 of earned income. Child tax credit: The income threshold of the refundable portion of child tax credit is increased to $3,000 in 2009 and 2010. Unemployment compensation: For 2009, people who lost their jobs can exclude up to $2,400 unemployment compensation from their income. Now that the stimulus plan is becoming a law, the Obama Administration wants to hear your opinion on the package. You can give The White House your feedback. Brenda: People on social security benefits will receive the payment late May/early June. You can fine more here. I would like a COMPLETE breakdown to the penny. For example: how much spent on new computers and vehicles for Feds. I want to see the entire list. Not just the BS “feel good” stuff. I heard that people 67 will be receiving a check for 300.00, besides the 250.00 check, people on social security is there truth to this. if and when will social security recipients receive the $250 that the president proposed for 2010?